For a period of a thousand years, from the fall of the Roman Empire in 476 to the 15th century Renaissance, Rome went through its own dark ages. The city was no longer the centre of the known world, the main political power was transferred elsewhere and all artistic production came to a standstill, or at least that is the impression we get today. 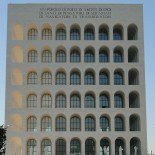 The amazing Classical and Renaissance art may overshadow all else in Rome, however, there are still testimonies of life in the Middle Ages in a limited number of places throughout the city. One of them is the Monastery of the Santi Quattro Coronati, or Four Crowned Martyrs, on the Celio hill behind the Colosseum. The Monastery seems to be off the beaten track today, but in the Middle Ages, it was strategically located on the via papale, the lost road of the Popes linking the Basilica of St John Lateran to the Vatican. 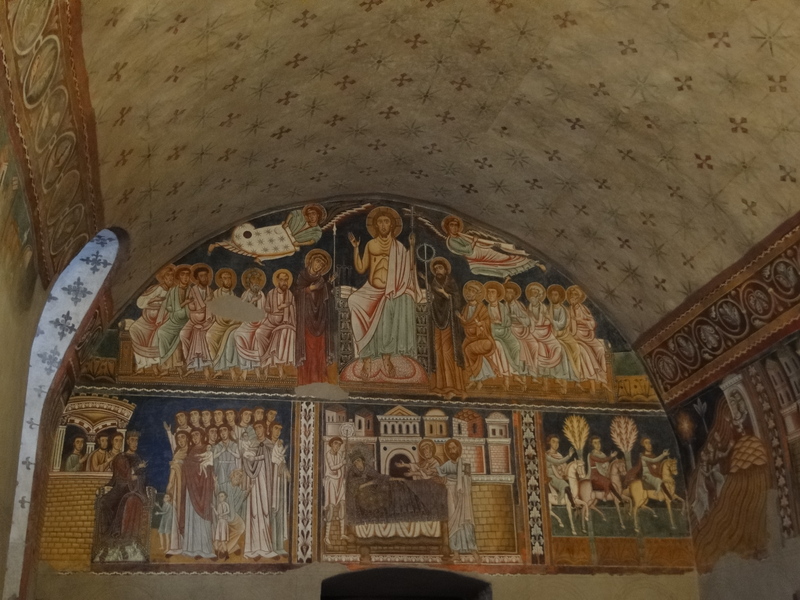 Inside the Monastery, run today by Augustinian nuns, the small chapel of St Sylvester contains a rare example of 13th century frescoes depicting the lives of Emperor Constantine and Pope Sylvester. According to the story, Constantine gave Pope Sylvester the city of Rome as a gift for having been cured of leprosy by him. The event was significant in the sense that it marked the historical transfer of power from the Emperor to the Pope and the subsequent supremacy of the Pope over the political power. Constantine was emperor between 306 and 337, while Sylvester was Pope from 314 to 335. 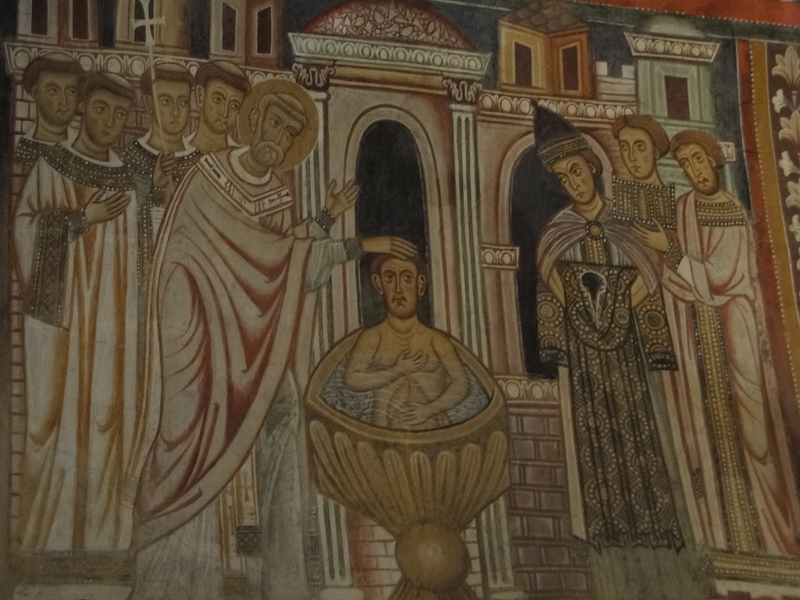 The anonymous cycle of frescoes pictorially describes Constantine’s illness and his dream that he should seek Pope Sylvester to cure him; the baptism of Constantine by Pope Sylvester which holy waters cured him, and the following donation of Rome to the Pope. The pre-Giotto paintings may look naive in their lines, but they have a great harmony in the colours and strong narrative qualities. It may be difficult for us to go back to the thinking of the times, but we are still able to appreciate the beauty of the frescoes, particularly in their intimate setting. The chapel is very small and only a few visitors are let in at the one time, that is when they are visitors. Only once I encountered a crowd, most times I was there on my own. The Monastery remains a place where the nuns live. As part of their daily ritual, they sing in the main church every afternoon just before opening to the public. 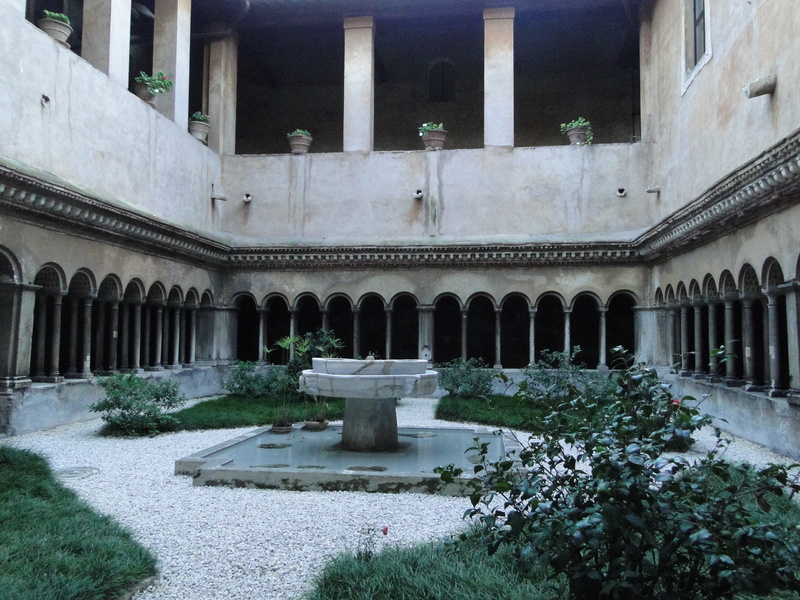 The first time I visited the Monastery, I happened to arrive just as they had started singing, so I sat there listening while I waited for the chapel and cloister to open. It was a nice way to temporarily escape the busy city and slowly absorb the place. The cloister, another place of interest there, was recently renovated, and more Roman ruins were found during the excavation. The Four Crowned martyrs actually refer to two groups of martyrs: the first one being the four Roman soldiers whose names were not known during their martyr, but were revealed later by the Lord, according to the Golden Legend. The second group were Christian stonemasons from today’s Serbia who refused to carve a sculpture of a pagan god for Emperor Diocletian. On the Emperor’s orders, they were buried alive in a coffin and thrown into the sea. Diocletian, emperor from 284 to 305, was particularly despotic. He was the first emperor to voluntary abdicate from his position. He retired in a palace on the Dalmatian coast, which is today part of the old centre of Split in Croatia. This entry was posted on March 29, 2011 by Salambo in Ancient Rome, Arts and culture, churches, English and tagged Constantine, Diocletian, Four Crowned Martyrs, frescoes, italy, Monastery, Pope Sylvester, Rome, Santi Quattro Coronati.